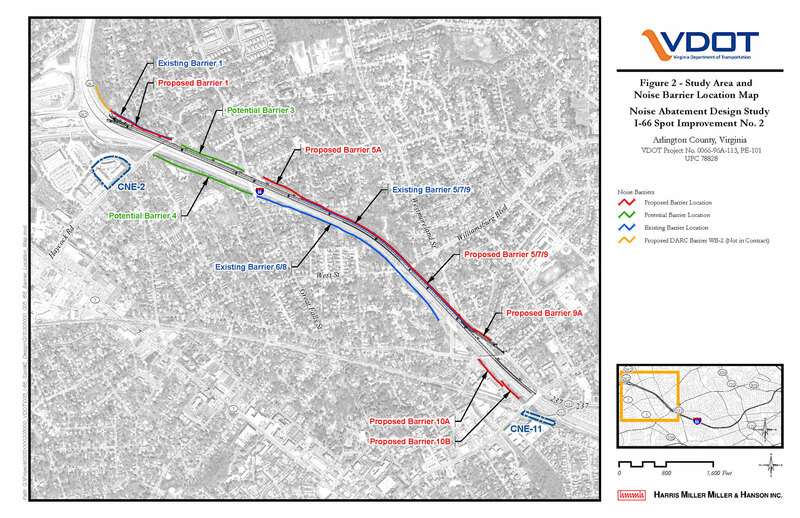 HMMH conducted detailed noise barrier design studies for over 20 barrier areas throughout the I-66 corridor within Arlington and Fairfax counties where an additional lane will be added to the westbound direction of travel. The design reviews follow a noise impact and preliminary barrier feasibility assessment conducted in 2008 by HMMH. More refined and detailed noise barrier designs were developed based on recent survey information and the updated VDOT noise policy. In some areas, existing barriers would be replaced by taller, more effective walls. HMMH surveyed affected property owners and residents who would be benefited by cost-reasonable barriers. Those barriers that are desired by the community are being carried forward for construction.